Since 1981, more than 1,100 people have become servant leaders in this community. Coming from the fields of business, government and not-for-profit organizations, they’ve been encouraged to develop their skills through educational programming, finishing projects for community service and learning through mentors. 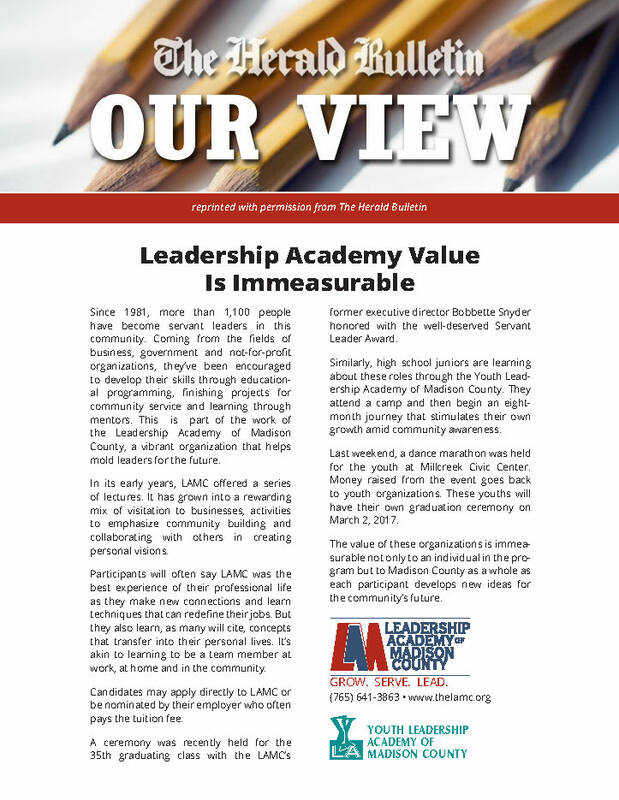 This is part of the work of the Leadership Academy of Madison County, a vibrant organization that helps mold leaders for the future. In its early years, LAMC offered a series of lectures. It has grown into a rewarding mix of visitation to businesses, activities to emphasize community building and collaborating with others in creating personal visions. Participants will often say LAMC was the best experience of their professional life as they make new connections and learn techniques that can redefine their jobs. But they also learn, as many will cite, concepts that transfer into their personal lives. It’s akin to learning to be a team member at work, at home and in the community. Candidates may apply directly to LAMC or be nominated by their employer who often pays the tuition fee. A ceremony was recently held for the 35th graduating class with the LAMC’s former executive director Bobbette Snyder honored with the well-deserved Servant Leader Award. Similarly, high school juniors are learning about these roles through the Youth Leadership Academy of Madison County. They attend a camp and then begin an eight-month journey that stimulates their own growth amid community awareness. Last weekend, a dance marathon was held for the youth at Millcreek Civic Center. Money raised from the event goes back to youth organizations. These youths will have their own graduation ceremony on March 2, 2017. The value of these organizations is immeasurable not only to an individual in the program but to Madison County as a whole as each participant develops new ideas for the community’s future.